The health benefits of hibiscus tea include relief from high blood pressure and high cholesterol, as well as digestive system, immune system, and inflammatory problems. It helps to cure liver disease and reduces the risk of cancer. It can also speed up the metabolism and help in healthy, gradual weight loss. Hibiscus tea is rich in vitamin C, minerals and various antioxidants, while also helping in the treatment of hypertension and anxiety. Hibiscus tea is ruby red in color and has a sour taste. Therefore, it is also known as sour tea and has a flavor similar to cranberry. It is widely available on the market throughout the tea-drinking world, and can be consumed hot or cold depending on your preference. This tea is low in calories and caffeine-free. 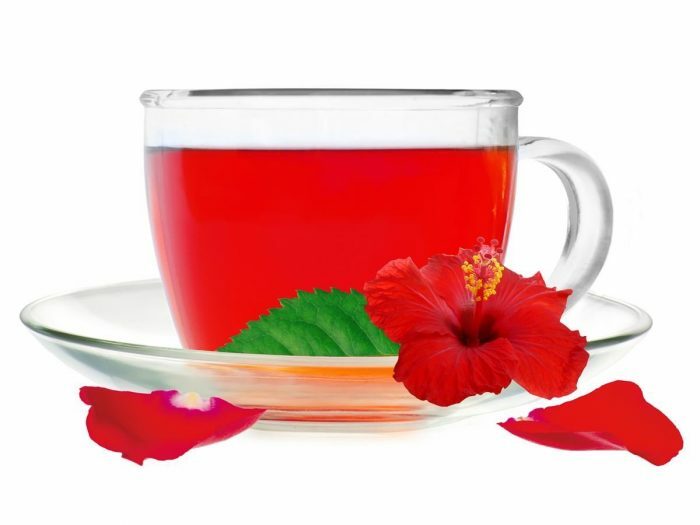 This article discusses the various benefits of hibiscus tea which would help in keeping the human body healthy and fit. Because of its anti-inflammatory properties, hibiscus tea can reduce blood pressure by up to 10 points, according to a research done at Tufts University in Boston. For this drastic improvement to occur, you need to consume three cups every day for a few weeks. Also, hibiscus tea has diuretic properties that increase urination, simultaneously lowering blood pressure. Lowering Cholesterol: Hibiscus tea also has impressive antioxidant properties. It helps to lower levels of “bad” LDL cholesterol from the body, thereby helping to protect against heart diseases and protecting blood vessels from damage. The hypolipidemic and hypoglycemic properties of hibiscus tea can be beneficial for those who suffer from blood sugar disorders like diabetes. A research study conducted on patients with type II diabetes suggests that consumption of hibiscus sour tea lowers cholesterol, triglycerides and low density lipo-protein cholesterol, which helps to manage this unpredictable disease. Antidepressant Properties: Hibiscus tea contains vitamins and minerals like flavonoids which have antidepressant properties. Consumption of hibiscus tea can help to calm down the nervous system, and it may reduce anxiety and depression by creating a relaxed sensation in the mind and body. Good for Both Summer and Winter: You can drink hibiscus tea either as a hot tea or an iced tea. If you want to keep yourself warm in the winter, brew it and drink it straight away. It only takes few minutes to make. In case you do not want to drink it hot, perhaps in the summer, you have the option to drink hibiscus iced tea. It takes about 20 minutes to prepare it properly, and then you can cool yourself off in a healthy, refreshing way. Pregnancy and Fertility: Hibiscus tea is not recommended for pregnant women, particularly due to its emmenagogue effects which may stimulate menstruation or blood flow in the uterus or pelvic region. For those undergoing hormonal treatments or taking birth control pills, it is recommended to consult your health specialist regarding consumption of hibiscus tea, and let them give you a yes or no.